I am admittedly not a huge CFL fan. Despite spending a summer partying with the Argos-In-Training at UTM (they shared rez with us summer students), my fandom is more of automatic loyalty than actually following the league. I am a fan of live music, and when the words “Matthew Good” and “concert” fall in the same sentence, regular readers know that my attendance is a given — which is how I found myself navigating throngs of football fans through multiple levels of the Metro Toronto Convention Centre in search of the mythic Molson Canadian House Concert Series. First off, allow me to introduce you to the MTCC: featuring numerous spaces for exhibition halls, performances, and themed “bars”, for lack of better terminology, the MTCC is a semi-convenient walk from Union Station. Once you’ve arrived, prepare to dole out ID for a mandatory wristband (the purpose was never explained to me) before descending several levels to the cement floor space with muddier sound than Kool Haus. Yeah: the MTCC houses an actual theatre with stage and seats, but corraled us into cement land, instead. Even better, doors opened at 6pm, but the music didn’t begin until 7:45pm. One assumes this was planned to coincide with street festivities ending at 6 and to encourage continuous imbibing of sponsor products. Needless to say, by the time the music was underway, many in attendance were drunk, approaching it or being thrown out for intoxication/general assholery. Not a great scene, especially when one is flying dry due to a thrown out back and painkiller consumption. Even better: promised venue accommodations for the differently-abled consisted of couches “if you could find one” that had no sight lines of the stage. There you have the venue. But what of the music, you ask? That was, thankfully, highly enjoyable. Up first was Sirius contest-winning band, ERA 9. Hailing from la belle province (that’s Montreal to you, Americans), ERA 9 delivers a melding of pop hooks with straight-up alt rock. While the lyric content delves into the outskirts of Nickelback territory with its booze and party vibe, ERA 9 manages to retain more class while doing so. 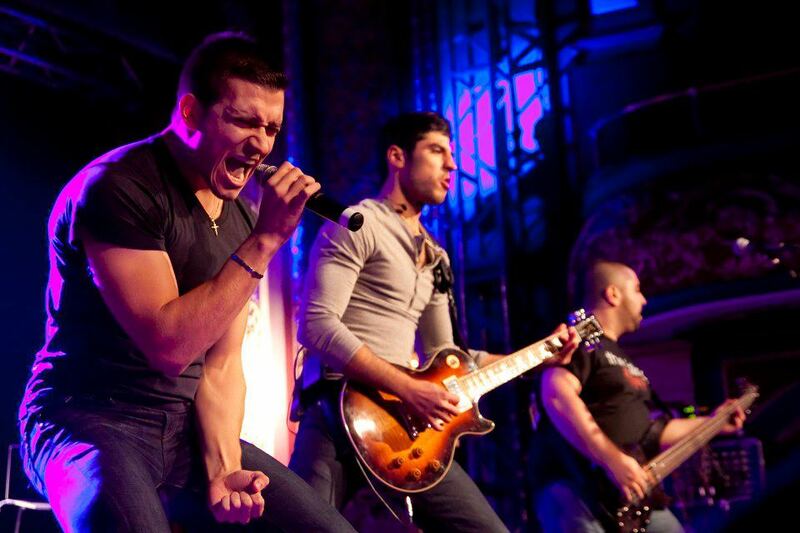 Fans of Fuel, Hinder or Hoobstank will likely dig the riff-heavy tunes and Phil Paolino’s pipes. Their stage presence is strong and lighthearted, which makes for an enagaging show. Are ERA 9 reinventing the rock wheel? Not really. But you know, a wheel is pretty awesome as is, and their polish was surely a key factor in their Sirius win. Swing by their official site to snag a free download of new single “Now You Know” and learn more about the band. The last two years have become an onslaught of bands resurging/reforming from my youth, which has both made me feel older and also provided the opportunity to see artists that teenage me couldn’t afford on her pitiful allowance and babysitting income. In this week’s Flashback Friday, I spotlighted this band and note that they were on the bill of the first concert I went to of my own accord as a teenager. I will always have love in my heart for Treble Charger. 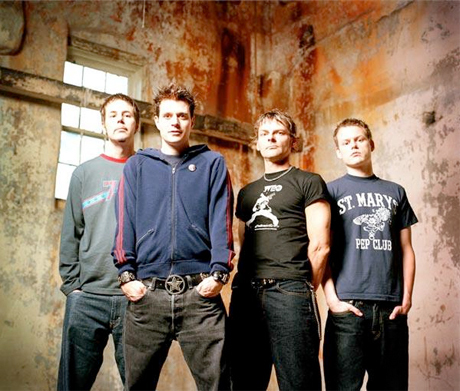 The more casual fans, primarily those most familiar with their later output, think of punk shredder tunes like “American Psycho” and “Hundred Million” when the band is brought up (an audience member told a friend they were “like Green Day”). The fans who dug beneath the radio single surface are well aware of the band’s softer side, where the more introspective lyrics dwell. NC-17 isn’t necessarily a perfect album, but it does contain gems that every fan of Canadian music ought to hear. Such a shame, then, that the dominant share of the crowd came for the commercial tracks and failed to properly appreciate the quieter numbers. Peppering their set with a back and forth rock/soft approach, Treble Charger delivered everything I remembered from my teens and more. I was reminded of how much talent the band possesses, and left with the urge to spin their catalogue properly for the first time in years. The venue sound wasn’t ideal, but front row centre was just fine for sonic immersion. Set choices stuck mainly to the hit singles and the popular choices, which was wise, given the crowd. I would have loved to hear “Trinity Bellwoods” and “Ever She Flows”, but short sets can’t cover everything. Highlights included “Red”, “American Psycho”, “Even Grable” and “Hundred Million”. Treble Charger is back, my friends. Check out their site and keep a vigilant eye for a show near you. Go snag their music while you’re at it. Up next was Matthew Good, who flew out from the studio where he’s crafting his 2013 release to rock the crowd. Given that, by his own admission, he’d neither played live nor truly rehearsed with the band for months, Good came off polished all the same. Grantedm setlist choices played a role in that, as Good favoured staple MGB-era hits and radio singles throughout the night, aside from closer “Champions Of Nothing” (a favourite of mine; thanks, Matt!). Part of it, however, speaks to his solid band, including the ever smiling Anthony Wright (with whom I traded grins and “I’m watching you” gestures, to my amusement). This ability to deliver in even less than optimal circumstances is precisely why we came, despite The Who playing across the street (although if Matt had followed through on his joke to buy us all tickets and head over, I would have been game). Good’s tendency to go for the radio-single setlist in situations like these often drives the long-term die-hard fans nuts. “I’m tired of these songs! I’d rather hear something rare!” On a selfish fan level, I would love to hear songs I’ve never heard, and I don’t think any fan of an artist would disagree with that wish. From a strategic point of view, it’s a testament to how well he can read or anticipate a crowd and pander to what will send most of them home happy. The chatter and obnoxious calls for “Rico” during “Champions” are precisely the reason why Good crafts the sets he does. That aside, I don’t ever tire of the staple classics. This may be because I only caught one MGB-era show ever, but then again, Matthew is a lyrical maestro. No matter what he thinks of the “My devil’s on Sugar Smacks down at the Radio Shack” line, it remains clever as ever to my ears, evoking a time and place. So no, I certainly didn’t mind rocking through “Load Me Up” or “Everything Is Automatic”. The man delivers the same gusto no matter what tune he’s belting at the moment. The passion, for me, makes the performance. The set choices are just the fine print. As for the more casual fans in attendance that might find their way here: you’re depriving yourselves. Grab the man’s solo catalogue. Some of his best work lies within. My one complaint? As much as I give credit to Sam Roberts for being talented, the wrong artist headlined. Myself and almost half the crowd left after Matthew Good left the stage. Granted, this was partially to accommodate Matt’s need to return to the studio, but it was unfortunate for Roberts. Had the music begun at 6:30, there could have been a very different ending to the night. Highlights: “Champions Of Nothing”; “Zero Orchestra”; “Born Losers”; “Everything Is Automatic”. You can get better acquainted with Matt at his official site (and glimpse sneak peeks at the new album coming together). Great show, but I hated Sam Roberts.